Out but not down! 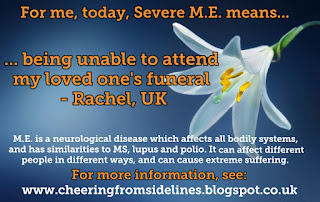 Thoughts about life with severe M.E. I don't know who to be today. I don't know *how* to be. I am a daughter-in-law. It's my lovely Father-in-law's funeral today, and I can't be there to say goodbye to this man who means so much to me. I am a wife and mum. My husband and daughter are grieving today, and I can't be there to support them. Can't be there to hold their hands, put my arms around them, let their tears soak into my shoulder. There are no adequate words. Breath clouding in front of me in the biting air, nose numb with cold, body wrapped up warm and cosy. It was the first time each year that I let myself wear hat, scarf or gloves; no matter how cold it got before November 5th, I saved up that delicious warm toasty feeling for that special night. Bonfire flames dancing, glowing against the darkness, warmth radiating. My ME started with a virus in 2011, some months after the birth of my daughter. 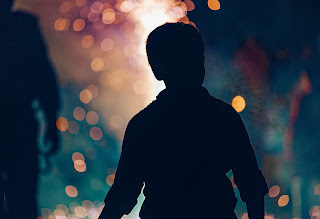 After the virus had apparently abated, the first symptoms I noticed were numbness, tingling, and pins and needles in my hands and feet; body temperature disturbances; vision problems; dizziness; clumsiness; pain; muscle spasms and weakness; sleep dysfunction; and cognitive impairments. For 18 months the GPs at my local surgery refused to take me seriously. They didn't believe I had anything physically wrong, dismissed my reports of physical symptoms, and said I was depressed. I knew this was not true, and that although I was extremely fed up and frustrated, this was a response to my physical symptoms rather than the cause of them. The award is for people who are (or have been) going through a tough time, who have inspired the nominee with their courage, strength of spirit, and perseverance. I'm afraid there's no ceremony, no glittering trophy, no prize; it's just a graphic, just one person saying to another that they are amazing. Hopefully the person who gave you the link to this page also told you why they specifically wanted you to have it! As I'm sure many others have done, I have in the past attended funerals or read obituraries online, and heard amazing things about the deceased. I've also too often heard the regret of their family and friends that they didn't tell their loved one those things while they were alive. I don't think we should wait until someone dies before we say how amazing they are! For a long time I have wished that I could nominate various people for some kind of national hero/bravery/courage award, but many of the people I would want to nominate would not be physically able to attend such awards. There's also the issue that many of my online friends live in different countries and I don't know which awards are given in each country; not to mention that I find it difficult cognitively to fill in those sorts of forms, and I've never heard back from any of the nominations I have done! Whilst writing my recent 'Do Not Go Gentle' post, an idea blossomed in my brain, and this post is the result. Grab the cuppa of your choice and make yourself comfy, this is a long one! But it may also be the most important and passionate thing I've written. 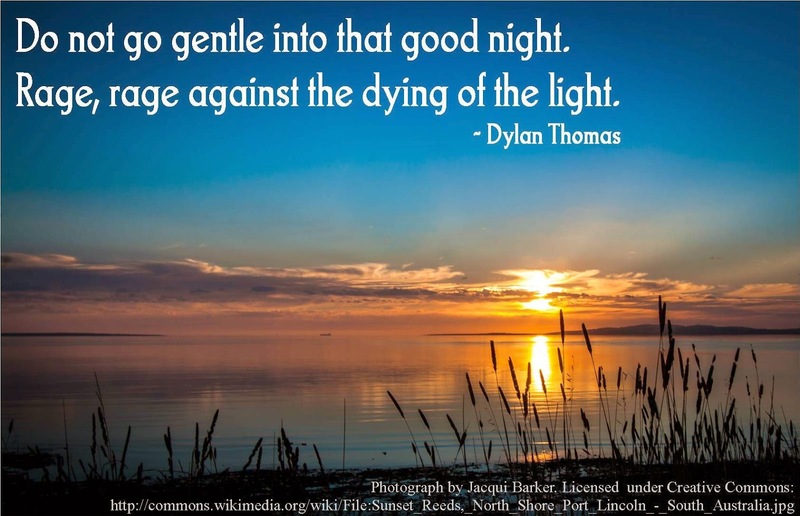 I love Dylan Thomas' poem 'Do Not Go Gentle'. (Click here to go to YouTube to hear the full poem read by the man himself.) I know, I know, it's about death, but actually I think it's about life and how you live it. We all have challenges of one kind or another; do you just resign and submit to the hand you've been dealt? Or do you strive for 'life in all its fullness'? 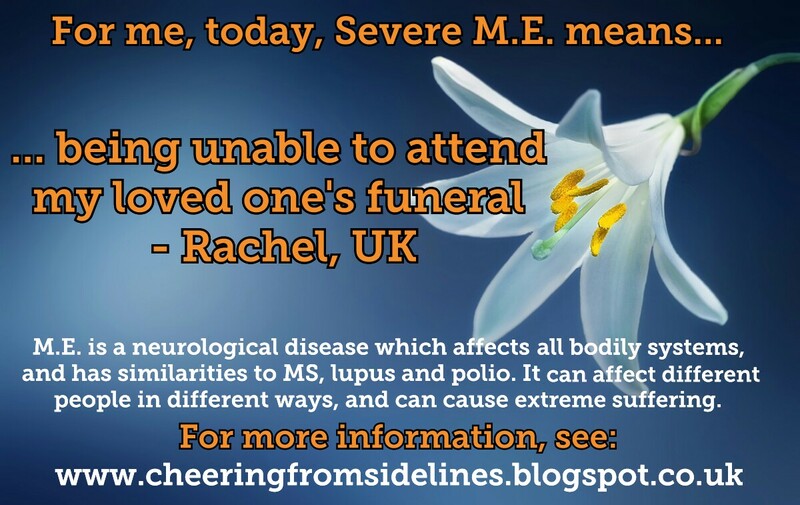 And what does that mean for those who are very severely ill, who are already in a living death? Some of this news is actually 'olds', and I'm really sorry to my family and friends who have been waiting to hear about stuff. It's just taken me a bit of time to get my act together. Also this was meant to be just a quick happy update post but I guess I needed to get a load of stuff off my chest - sorry! (c) Rachel Higginson 2014. Travel theme. Theme images by Josh Peterson. Powered by Blogger.